and is the circulation of the flow around the cylinder. (Note that the velocity field can be irrotational, but still possess nonzero circulation around the cylinder, because a loop that encloses the cylinder cannot be spanned by a surface lying entirely within the fluid. Thus, zero fluid vorticity does not necessarily imply zero circulation around such a loop from the curl theorem.) Let us assume that , for the sake of definiteness. The stagnation points correspond to the points at which (because the normal velocity is automatically zero at the surface of the cylinder). Thus, the stagnation points lie at . 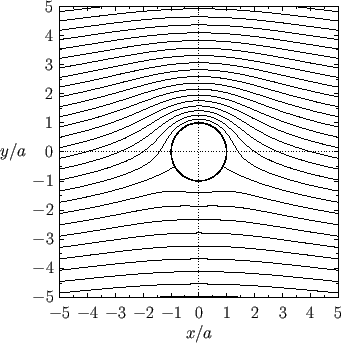 When , the stagnation points coalesce and move off the surface of the cylinder, as illustrated in Figure 5.8 (the stagnation point corresponds to the point at which two streamlines cross at right-angles). 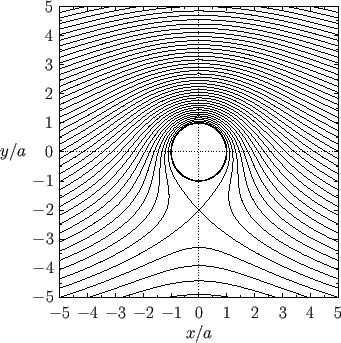 Figure: Streamlines of the flow generated by a cylindrical obstacle of radius , whose axis runs along the -axis, placed in the uniform flow field . The normalized circulation is . The component of the force that a moving fluid exerts on an obstacle, placed in its path, in a direction parallel to that of the unperturbed flow is usually called drag. On the other hand, the component of the force that the fluid exerts in a direction perpendicular to that of the unperturbed flow is usually called lift. Hence, the previous equations imply that if a cylindrical obstacle is placed in a uniformly flowing inviscid fluid then there is zero drag. On the other hand, as long as there is net circulation of the flow around the cylinder, the lift is non-zero. Lift is generated because (negative) circulation tends to increase the fluid speed directly above, and to decrease it directly below, the cylinder. Thus, from Bernoulli's theorem, the fluid pressure is decreased above, and increased below, the cylinder, giving rise to a net upward force (i.e., a force in the -direction). We, thus, conclude that the rate of change of the circulation around is equal to minus the flux of the vorticity across [assuming that vorticity is convected by the flow, which follows from Equation (4.85), the fact that , and the fact that in two-dimensional flow]. However, we have already seen that the flow field surrounding the cylinder is irrotational (i.e., such that ). It follows that is constant in time. Moreover, because originally, as the fluid surrounding the cylinder was initially at rest, we deduce that at all subsequent times. Hence, we conclude that, in an inviscid fluid, if the circulation of the flow around the cylinder is initially zero then it remains zero. It follows, from the previous analysis, that, in such a fluid, zero drag force and zero lift force are exerted on the cylinder as a consequence of the fluid flow. This result is a manifestation of d'Alembert's paradox, which was introduced in Section 4.5. d'Alembert's result is paradoxical because it would seem, at first sight, to be a reasonable approximation to neglect viscosity altogether in high Reynolds number flow. However, if we do this then we end up with the nonsensical prediction that a high Reynolds number fluid is incapable of exerting any force on an obstacle placed in its path.